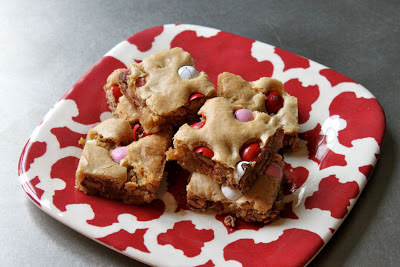 I told you I wanted to get back to baking and blogging so here I am with another post. I planned to take these little gems to work this past Monday, but alas I have a baby that attends day care which means he gets sick...a lot. I took Noble to the pediatrician Monday to find out he had an ear infection. Poor little guy. He also happened to bring me home a cold. I am not certain that he was the carrier, but I am think it is safe to assume. Noble and I are feeling much better now, but needless to say these blondies never made it into work. Zack was able to take half to his work and then I ate a few too many at home. They are really simple to make and very delicious. The original recipe used Rolo's, but I thought it would be fun to use Peanut Butter M&M's and they turned out great. Preheat oven to 350 degrees Fahrenheit. Grease a 9-inch by 13-inch pan and set aside. In a saucepan over medium heat, melt the butter and brown sugar, stirring constantly until smooth. Remove from the heat, and stir in the peanut butter, until creamy and combined. Set mixture aside to cool. Add the eggs, one at a time, to the peanut butter mixture, mixing well after each addition. Add the vanilla extract and stir to combine. Pour the mixture into the prepared dry ingredients, and stir until batter is smooth. Stir in the M&M's. Transfer the batter to the prepared pan, spreading the batter evenly to the edges of the pan. Bake for 25-30 minutes or until the top is golden and the edges are slightly browned. 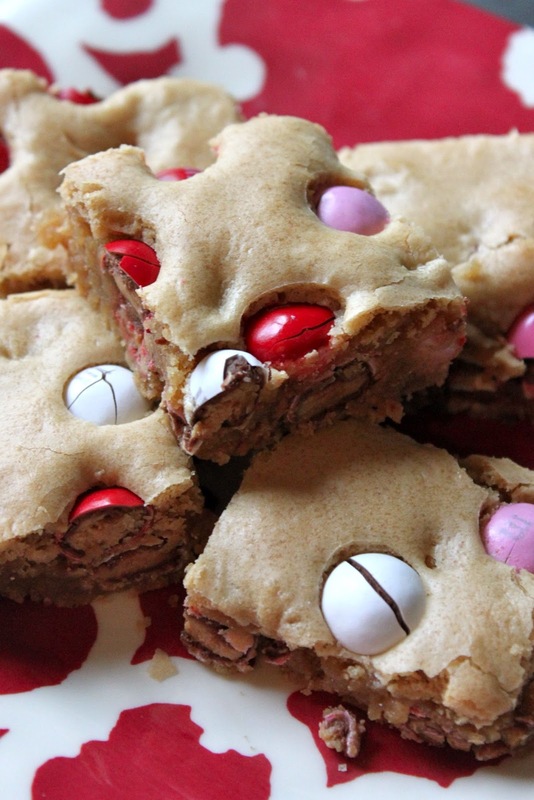 Remove blondies from oven and place them on a wire rack to cool. Once cooled, cut into squares and serve.